This past day was a bittersweet one. My sister and Dad's sister and her husband and I set to work on cleaning out the basement of my parents' house. Just something that has to be done, sooner than later. The entire house is being cleaned out, top to bottom. Because in a few months the house that my family has called home for all these decades will be ours no more. On a more personal note, I will be looking for an apartment soon, depending on where the Lord leads me. Which, could be literally anywhere. For the first time in my life I am truly on my own. I did everything that I could for Mom and Dad. Now is time at last to see what's out there. I can go anywhere, do anything. It's a very thrilling time in my life... and I'm feeling younger than I have felt in years. Maybe I'll stay around here. Or relocate to Florida. Lately the notion of doing some overseas missionary work has crept into mind. So many places where I could probably be happy. Maybe at last the little bit of happiness that I've always wanted, even. This is what Dad, and Mom, would have wanted of me, no matter where it is that I go. And that could be any number of places. There are only two absolutes: Tammy the Pup will be accompanying me (that little girl and I are attached at the hip) and there must be real bona-fide broadband Internet. All this time I've been using a satellite connection and there's not only a monthly data quota, but also HORRIBLE latency. Wherever the new digs are will certainly be a place where I can do online gaming with "Weird" Ed and all our other wacky pals. Not to mention getting to use a Roku. But that's yet to come. Right now, there is the very difficult business of settling Dad's estate. Something that I had no idea was so wrought with intricacies and hurdles. So we spent most of the day cleaning the basement. Going through everything. So much of Mom and Dad's belongings and darn nearly all of it triggering memories for me. I was literally telling Anita and my aunt and uncle the year and day that we got this item and that. Such as the VCR that Dad bought three weeks before Christmas in 1984. And the stereo that was a present to Mom in 1979, when I was almost six years old. And "newer" things like the first satellite receiver, from 1997 when it was still Primestar. All of those were so shiny and new once upon a time. Now useless and collecting dust and forgotten about, as will be with most of the possessions around us eventually. "Life is a vapor". The materials which we accumulate, much more so. So much of what we found brought back many, many cherished memories for all of us. When we came across Dad's cap collection, that hit me hard. He collected so many caps over the years. We didn't know what to do except to put it with everything else going into the dumpster we've rented. And for a while, doing that walloped me hard. But there are other caps of his that I can hold onto, and so I can still honor his memory that way. Some of what we've found will be sold at an estate auction later. The rest is consigned to that dumpster. And soon that will be the end of that. Well, there is one other thing worth mentioning. At long last I am looking at selling off most of my Star Wars collection. First I have to get it cataloged... which could take weeks. Then I have to figure out how exactly to sell it: eBay or Craigslist or somesuch. It all needs to go to good homes. But I'm going to keep the pieces that have especially great importance to me. I'm still debating the Slave Leia cardboard stand-up that my sister gave me for Christmas when I was in college: she said that putting it in my apartment would make sure that I woke up to a woman every morning (her words). It's finally sinking in. This home will soon no longer be "home". But I think that things will work out fine. God has taken care of me this far along. Maybe He will bring me a little further. There is one thing from the estate of Robert Knight that I'm not sure how we are going to dispose of. It's a cache of items which I discovered this afternoon, on a high shelf - untouched for decades - in the basement. As I was pulling out dust-covered jars and bottles, some dating to the Fifties, my hand touched something round and metal. And when I saw what it was, I could scarcely believe it. Dad had told me years ago that he had some of this stuff, but until this past afternoon I had never laid eyes on it. 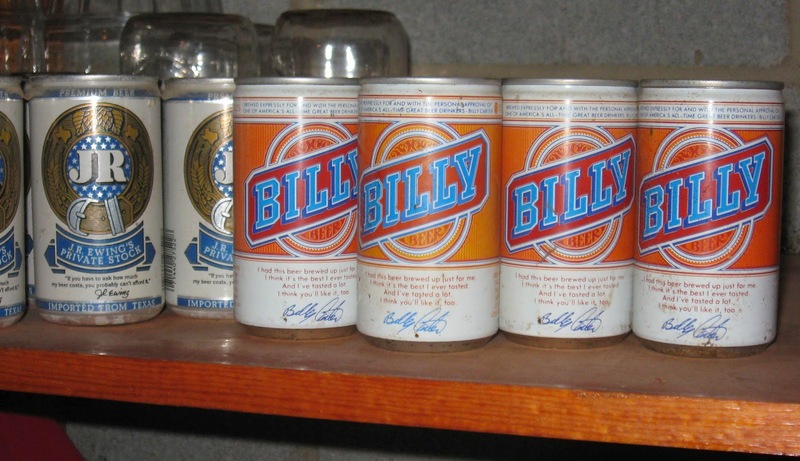 And next to the Billy Beer cans (which were still filled with beer) there were a few cans of J.R. Ewing's Private Stock, which I assume was from around 1980 and the "Who Shot J.R.?" hype. Billy Beer. Somehow, that made all the work and yes, heartbreak that we went through this past day worth it. It's the kind of thing that Dad would have bought, as a novelty if nothing else. I don't know what I'm going to do with those cans. Maybe donate them to some strange museum for this kind of thing? Hey, Billy Beer can't be all bad, can it? "MMMMMMM... We elected the wrong Carter." That is an amazing find. 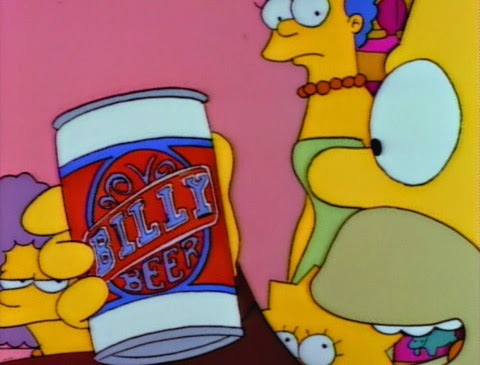 You will have no problems finding anyone who will give the Billy beer a good home.